It’s unbelievable to think that the Royal Castle chain at its peak in the late 1960s had 179 locations throughout Florida, Georgia, and Louisiana, 40 of which were in Dade, Broward & Monroe counties. Now, there is one Royal Castle left at 2700 NW 79th Avenue. There’s been a recent update on the lighted menu boards but not much has changed as far as the decor is concerned. I wouldn’t touch a thing about the place if I were the owner James Brimberry. I waited patiently in line and ordered a Royal Castle Burger 6 pack with Cheese and some of the crinkle-cut fries so did my friend Mario. We took them home and I ate half that night and had the rest the following morning for breakfast. The Royal Castle Burgers were a little larger than I remembered them being, no complaints here. And yes, they’re still great. Go out, be old school and support this Miami landmark. Box of Castleburgers- no cheese. There were plenty of Royal Castle restaurants in Northeast Ohio but all were gone by the late ’70’s. 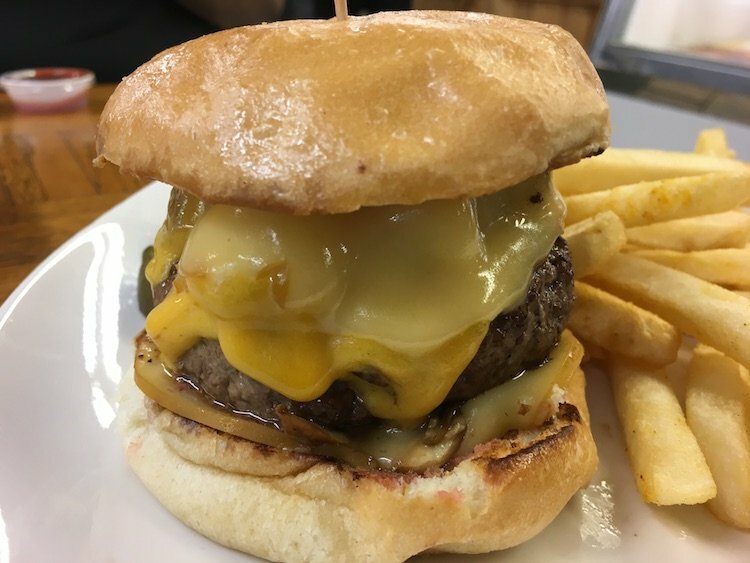 The local concessionaire used to sell Royal Castle burgers and the heavenly ‘Birch Beer’ from a tavern he owned on Cleveland’s West Side known as the City grill up until a few years ago. Will need to make a stop there next time I visit MIA. Those Royal Castle restaurants in Ohio were not related to the Miami chain. William Singer gave his brother the right to use the name and concept in Ohio. It was a separate chain. I have some plates from 1961 with the Royal Castle logo if anyone is interested. Found then in a storage unit in Cleveland. Do you still have royal Castle plates available? I do. Also saucers and bowls. Any data on store locations? We had a Royal Castle in my home town 55 years ago. They had the BEST fricking honey buns. Like Krispy Kreame but better, in a 1963 kind of way. Jack: Who put the frick in french fries? Customer: There ain’t no frick in french fries. Just found “The Royal Spatula” magazine from March-April 1962. It is a monthly magazine for the employees and families of Royal Castle. The cover states ‘Our 100th Royal Castle – Opening In Miami’. It discusses the opening in Miami, has pictures and write-ups of employees and more. I have enjoyed reading this article after finding the magazine. Did you work for Royal Castle? No, the magazine belonged to someone I know who was a manager of Shop 48, Chic Hagel. I still have some of the new China dishes with Royal Castle logo that I purchased when I leased one of the last few still in operation. Early first pattern used 1930’s-40’s era. Looking for any information on a man (possibly with the name Mike), who worked at the Royal Castle in West Palm Beach in 1969 and 1970. If you know this person or have any information that might be useful in my search, please email Jodie @ bettyboop28705@gmail.com. There were two ladies that worked there as well……..Dagmar Joeggi and Melanie Gayle Lewis. I worked at a Royal Castle in Daytona, FL in 1965. The food was great but we were so busy all of the time that I seldom got to eat the food. Those little sliders were soooo good! I started at the Royal Castle in Lakeland and worked my way up to Area Manager of Hillsborough, Polk, and Pasco Counties. As the company wound down I absorbed everything in the north and Jim Brimberry absorbed everything in the south. I worked for the chain for 18 years. I would like to hear from any of the old Area Managers who are still around.